DO IT. For real, apply. Even if you have the slightest thought in your mind that being an RA is something you might want to do, go for it. I was really on the fence about it, especially because you might regret it later if you don’t apply now! Be Yourself! Don’t try to put on a hat of “the perfect potential RA”. Just be yourself, show the Selection Committee who you are, and put your best foot forward to every step of the process! Ask Questions. We as current RA’s and everyone who works in the Office of Residence Life are here for you! If you have any questions along the way about the job, the application process, or even after you get hired, there is an amazing team of people waiting to back you up and support you, so utilize them! All in all, being a Resident Assistant has been one of the most rewarding jobs I have ever had. I have gained amazing transferable skills, made amazing friendships, and become much more confident in myself as a person and a leader on this campus. So for you, potential Resident Assistant, go for it. And soon, you might be saying hello from the other side! There is still time to attend an information session and apply (if you act fast!). Stop by the Office of Residence Life by the end of the day Friday, February 5th! 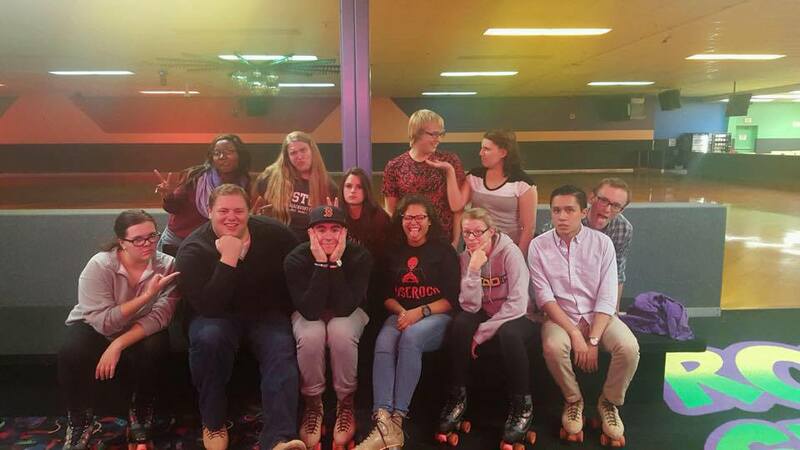 Being an RA is hard work, but it’s also a lot of fun. Here’s my staff when we went rollerskating last semester!